A big, fruity white wine! Filled with floral aromatics and rich, luscious fruit character! Complex and wonderfully balanced, this off-dry wine has subtle oak character and lots of fruit notes! A popular blend reminiscent of the finest French appellation offerings. 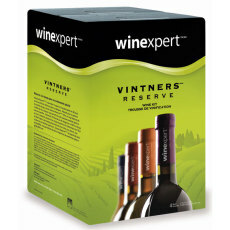 Produces an exquisite, well-balanced, aromatic red wine that is well rounded and robust. This wine kit is available by special order only. Let us know if you would like one and we would be happy to acquire it for you. Firm, dry red wine style of the famous Tuscany region of Italy. Characteristically tannic, this robust Italian wine bursts with flavours of berries, spices and herbs. This supple, fruity and delicate red nouveau style wine is typically consumed young and is at its best when served slightly chilled. This very popular grape produces a wine with very fruity, yet spicy characteristics. Vintners Reserves big red wine offering. Rich and flavourful, this purposeful blend marries intense aromas with complex flavours bursting of cherry and raspberry. Characteristically deep in colour with black cherry and berry aromas. The full fruit intensity of this wine has made it an increasingly popular varietal worldwide. The perennial white wine favourite. A remarkably versatile wine, this classic now includes oak for a rounded vanilla-oak structure that is smooth and appealing.